How do I Invest in Index Funds for Minor Children? You can invest in an index fund for a minor, but you might want to maintain control. 3. How Can I Give a Portion of My IRA to My Adult Children? Index funds are shrewd investment vehicles for children because they often have low fees. The savings over a lifetime can be enormous. Deciding to use an index fund is the easy part. The real question is how and when the child will gain control of the investment. If you don’t want to give your 18-to-21-year-old child complete access to a large chunk of money all at once, consider using a trust account. Index funds have lower fees because they are passively managed -- you're not paying for a manager to make investment decisions. Indexes are benchmarks, so your fund won't underperform, allowing you to stay committed to the fund for the long term. Also, you aren't distracted by trying to pick winning funds and can spend your time on other investing issues, such as asset allocation. You can buy index shares through a mutual fund or exchange-traded fund. 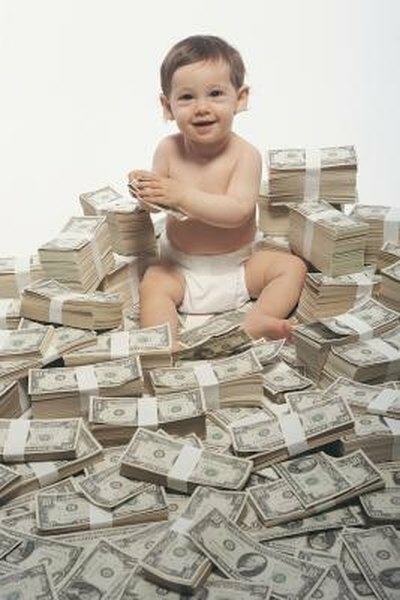 If you simply set up a fund in a child’s name at a mutual fund company or brokerage, the child will be able to control it at age 18 or 21, depending on your state’s laws. This method gives you the widest latitude in picking index funds but the least control over the money's use. The money you invest in the child’s fund is subject to gift tax. As of 2013, you can give up to $14,000 to each recipient without triggering a gift tax. The first $5.25 million of taxable gifts are exempt from taxation over your lifetime. If your child is old enough to earn income, she can open an individual retirement account and invest her contributions in index funds. You can set up a custodial account for a child and invest it in index funds. Custodial accounts are created under state laws, the Uniform Gifts to Minors Act or the Uniform Transfer to Minors Act. The first $1,000 of earnings per year are tax-free and the second $1,000 are taxed at the child’s rate. Once again, the child receives control of the money at age 18 or 21, depending on your state. You can act as the trustee of the account and pick out index funds investments. Money in a custodial account will count as a resource and possibly reduce the amount of educational financial aid available to the child. Another type of custodial account, known as a 529 account, can be used to save for a child’s education, but you may have less say on how the money is invested. If you want more control over the child’s money, you can set up a Crummey Trust with the child as the beneficiary. The trust has special rules that allow you to take advantage of the gift tax rules and exclusions. You can be the trustee or you can name someone else. Trusts allow you to set the rules on how the assets will be distributed to the beneficiary. You can set distribution conditions including age, allowable uses of the money and attainment of life events, such as marriage or having children. You can set up the trust with a mutual fund company and direct the investment of the fund assets into index funds. Trusts can become complicated and have tax implications that you will want to explore with an expert before proceeding. A unique alternative is a Kiss Trust, a patented trust account offered by Eastern Point Trust Company. It is an irrevocable trust -- once you place money in it, you can’t reclaim it as you can with a revocable trust. The innovation of the Kiss Trust is that it inexpensive and quick to set up online. You can choose from thousands of investment options, including index mutual funds and annuities that invest in index funds. Eastern Point acts as the trustee. The fund doesn't count as a resource when the child applies for educational aid. You can set up distribution rules that are as simple or complex as you want. Can You Close a Custodial Account? Can I Invest in a 529 Before My Children Are Born?